You may think that you have free speech in America, but that does not apply to the Holocaust. The RCMP is reviewing a posting to a Vancouver buy-and-sell group on Facebook that made light of the Holocaust, but an expert cautions that securing charges in such cases could be difficult. The post advertised a “Jewish bunk bed for sale” with an image of an oven, a reference to the gas chambers and crematoria used to kill Jewish people and burn their bodies during the Holocaust. The ad was posted to the group, which has nearly 50,000 members, on Thursday and had been taken down by Friday morning. Facebook user Rory Richards reported the post to the Vancouver Police Department’s hate-crimes unit. She eventually received a response from the B.C. RCMP. “From our team’s perspective, this is exceptionally offensive commentary that has absolutely no place in any type of public forum, or civilized society, for that matter,” RCMP Corporal Anthony Statham wrote in an e-mail to Ms. Richards. Holocaust denial is against the law in 21 countries now, and will soon be agaist the law in America. Trump spoke at a ceremony [today] hosted by the U.S. Holocaust Memorial Museum [in Washington, DC] to mark the unveiling of a new conservation and research center. The center will serve as a repository for a vast collection of artifacts by those who survived Adolf Hitler’s massacre of Jews during World War II. Members of Congress and Holocaust survivors — whose strength and courage Trump said was an inspiration — attended the emotional event in the Rotunda, the center of the Capitol. Survivors lit candles at the end of the ceremony. Trump did not use the word Nazi in his speech, since he does not know how to pronounce this word. I have just learned that people on Twitter are tweeting about some of my blog posts. What a revolting development this is! I signed up for Twitter but I have yet to complete my account. Now I have learned that people are tweeting about the Majdanek camp in the Holocaust. My website is kosher — written before I became a Holocaust denier. My blog is not kosher; it is full of denial, so be cautious in quoting my blog. This morning, when I started my day by reading the most recent Holocaust news, I read an article which includes all the false information that you will need to know when America becomes the 21st country to pass a Holocaust denial law. After the Nazis had conquered Poland in September 1939, Majir Korenblit and his teen-aged sweetheart Mania hid from the Gestapo, along with a handful of other Jews, in a hand-dug crater underneath a three-story haystack. Eventually, hunger forced them out of their hiding place and they went to work for the Nazis in the Hrubieszow ghetto. When the Gestapo came to the ghetto, Major and Manya separated and escaped, spending the next 2 1/2 years on the verge of death. Between them, Majir and Mania survived 13 concentration camps, including Auschwitz where both acquired a tattoo on their arms when they were registered. Mania survived Auschwitz because she volunteered to work in Czechoslovakia where she was liberated by the Soviet Army. Majir was sent to Germany to work and wound up in Dachau in the last days of the war. Mania and Majir lost their entire families in the Holocaust, except for Mania’s younger brother Chaim, who moved to Great Britain after the war. Mania and her brother were reunited in 1982. To get back to the news article, the following quote describes how students are taught today about the Holocaust. Without trivializing the Holocaust, Mike explained to the students that the Holocaust started with a group of people being bullied. The bullies, the German soldiers, targeted certain victims, not only based on who they were, but on their appearance, sexual orientation and religion. “There were also those who stood by and watched while others were victimized, and didn’t do anything to stop it. In many ways, the Holocaust shared the characteristics of school bullying,” Mike said. News articles like this are very upsetting to me. Rarely does a news article explain what really happened. Nobody cares about the true story of what really happened. It’s all about teaching the Jewish version of history to young people today. Holocaust denial is the act of denying the genocide of Jews and other groups in the Holocaust during World War II. Holocaust denial often includes the following claims: that Nazi Germany’s Final Solution was aimed only at deporting Jews from the Reich, but that it did not include the extermination of Jews; that Nazi authorities did not use extermination camps and gas chambers to mass murder Jews; and/or that the actual number of Jews killed was significantly lower than the historically accepted figure of 5 to 6 million, typically around a tenth of that figure. I was banned from writing on Wikipedia long ago. Many years ago, I tried to make a correction on Wikipedia and I was banned, even though my correction was correct, and it was later written by someone else, and added. The official figure for the number of Jews killed by the Nazis in Auschwitz is now 1.1 million. I wrote the blog post which is cited above, 7 years ago, and it is still being read today. Why are people all over the world still interested in the Dachau shower room? The website page, cited above, was written before I became a Holocaust denier. That’s what happens to people who see too many fake gas chambers — they become deniers, and they might be thrown into prison in 20 different countries which now have Holocaust denier laws. President Trump has done some rash, bad things since he took power three weeks ago. But his critics have done something rasher. Something even more bereft of reason than Trump’s orders and tweets. Something more likely to stoke prejudice. They’ve reduced the Holocaust to a meme. They have used and abused the greatest crime in history to underscore their contempt for Trump, comparing him to Hitler, talking of his travel ban in the same breath as the Nazis’ persecution of Jews, warning darkly that ‘we know how this ends’. And in the process they’ve relativised the Holocaust. They’ve normalised it. They have dented its gravity and uniqueness by presenting it as a routine, recurring feeling in history that currently finds expression in ‘Trumpism’. They have turned the extermination of Europe’s Jews into an exclamation mark to their angst over Trump, and that is unforgivable. Morally, politically and historically, it is worse than anything Trump has done so far. There is more than one way to deny the Holocaust. Some do it maliciously, with racist intent, arguing that the Holocaust is a hoax, an invention of Jews who wanted to secure their moral and political power in the postwar era. Others do it more thoughtlessly, with what they consider to be good intentions: they treat the Holocaust as a motif, to be wielded against any contemporary political idea or movement they find terrifying or simply don’t like. Bad people become ‘New Hitlers’, awful conflicts are said to echo the Holocaust. Holocaust dilution, we might call it. And it is a close, if sometimes unwitting, cousin of Holocaust denial. Holocaust dilution has been rampant in media and radical circles over the past three weeks. In the overblown, sometimes even unhinged response to Trump, all sense of moral and political decorum, or basic reason, seems to have been abandoned. Journalists speak openly of ignoring Godwin’s Law in the Trump era — Godwin’s Law being the internet adage that if a web-based discussion about politics goes on long enough, someone will make a potty Hitler analogy. This grating BTL (‘below the line’) habit has now burst upwards, into actual commentary, and is embraced by the very hacks who for years sneered at the sad web-surfers who couldn’t go five minutes without typing ‘HITLER’. Comparing someone to Hitler is the worst insult you can make. Is President Donald Trump a Holoaust denier? 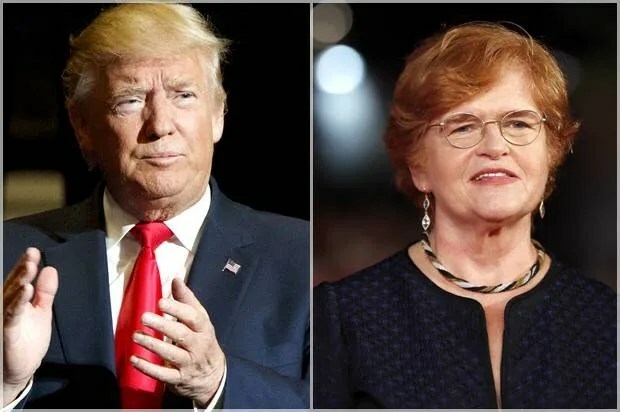 A recent news article, which quotes Debora Lipstadt, hints that The Donald might be a Holocaust denier. Or maybe he is just ignorant about the Holocaust, in spite of the fact that his son-in-law Jared Kushner is Jewish. This omission is especially troubling in light of the fact that Holocaust denialism — which is about either outright denying or aggressively downplaying the Jewish genocide at the hands of the Nazis — is a common feature of the specific variety of white nationalism that’s being mainstreamed by Trump and his “alt-right” advisers, including Steve Bannon, who formerly ran Breitbart. The fact that Trump’s Holocaust statement was issued at almost the same time as his ban on refugees and immigrants from certain countries — which reminded many observers of the efforts to turn away Jewish refugees during World War II — did not help matters. In addition, Trump is known to be fond of conspiracy theories, including overtly racist ones like the “birtherism” claim he lobbed at former president Barack Obama. Holocaust denial is the granddaddy of conspiracy theories, and many of the common tropes and strategies used by a wide range of conspiracy mongers can be traced to efforts to deny or explain away the Nazi campaign to murder Jews. America does not have a law against Holocaust denial — yet, but Trump is setting a very bad example. It is time for him to get with the program, and honor the Jews who were killed in the Holocaust. America should have a special day to acknowledge that Jews, who tried to escape the Nazis in Germany, were turned away when they tried to escape on the ship named the Saint Louis. The ship was forced to return to Germany where the passengers were killed by the Nazis in gas chambers. Oh, the humanity! Is Holocaust education needed more than ever? Today, the Ryerson [University] Student Union released this statement that seems to imply that Holocaust denial is a legitimate disagreement – by claiming that motions like this one on the Holocaust “invoke many views.” It implies there is a legitimate view other than “the Holocaust was a tragedy that needs to be addressed,” a viewpoint that is positively vile and a sign these students need Holocaust education more than ever. There are two sides to everything — except the Holocaust. Regarding the Holocaust, there is only one side to the story. If you believe anything except the Jewish side of the story, you will soon be on your way to jail, in 20 countries, not including America. Note that the gas chamber in the main Auschwitz camp was next door to the oven room, but for some unknown reason, the heat of the oven room never caused an explosion.